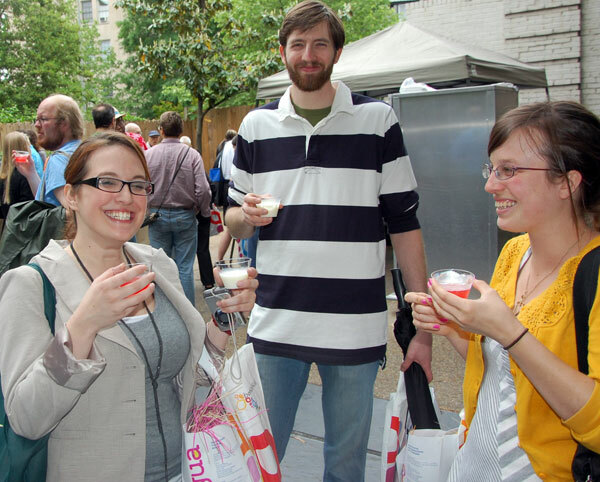 For the third consecutive year, the Embassy took part in the popular event which sees tens of thousands flock to DC to sample the cultures of the countries represented by the Embassies in Washington. And for the third consecutive year, word about the conch fritters and ‘Sky Juice’ offered by the Embassy of The Bahamas filtered through the crowd of travellers, making The Bahamas one of the more popular stops on the circuit. Nearly two dozen Bahamians – headed by Bahamas Ambassador to the US Cornelius A Smith and including both Embassy staff and Bahamians and people of Bahamian descent living in the DC Metro area – came together to put on the event, working days in advance to prepare the Embassy grounds to host the event, putting up decorations and adjusting the layout of the grounds to make the visitor experience the best it could be. In addition to Bahamas-themed decorations, posters of Junkanoo and other Bahamian scenes were put up around the grounds, providing rich splashes of colour and vibrancy. However, it was the other sort of decoration that proved to be most popular: Junkanoo headpieces. 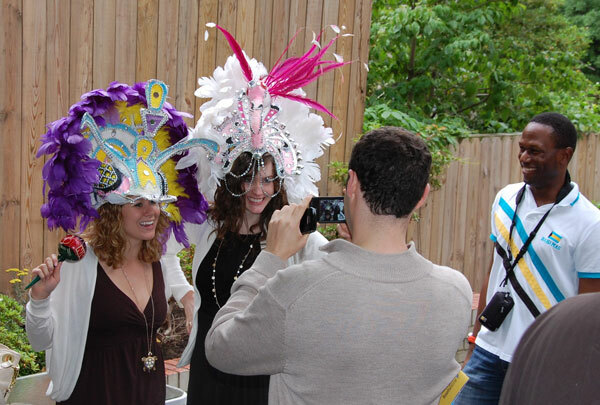 A number of Junkanoo headpieces were placed around the grounds, and it was only a short while before people started trying them on and posing for pictures ( see accompanying photos). 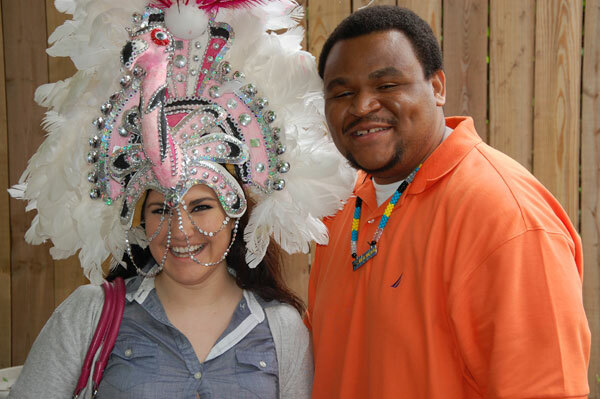 The Junkanoo pieces proved to be one of the biggest attractions of The Bahamas experience. The main attraction, however, was the cuisine. The conch fritters – with a batter prepared by Chef Apple Wells, who will also be catering The Bahamas Independence Celebrations in DC this July – were an immensely popular offering, garnering fulsome praise from tasters. Many people could be seen taking notes on the ingredients, and many a thoughtful expression could be observed on what could only have been slow-chewing home cooks. The ‘Sky Juice’ – that inimitable Bahamian concoction of spirits and coconut water – was also extremely popular. “What is that? That is delicious,” exclaimed one particularly moved patron. His sentiments were echoed many times throughout the course of the day. The Embassy also pumped up the volume on the Junkanoo music, which played from the early morning until after the event ended. There were occasional dance lessons, wherein Embassy staff taught visitors how to “rush,” and how to do “the Vola,” among other dance steps. 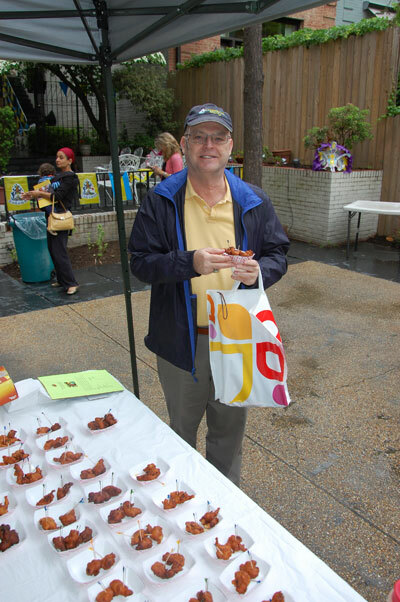 Among the many benefits of the event – which included a chance for the volunteers to sample some of Chef Apple’s cuisine! – a major boon was that members of the Bahamian community in DC came together and got to know each other while enthusiastically promoting Bahamian culture. 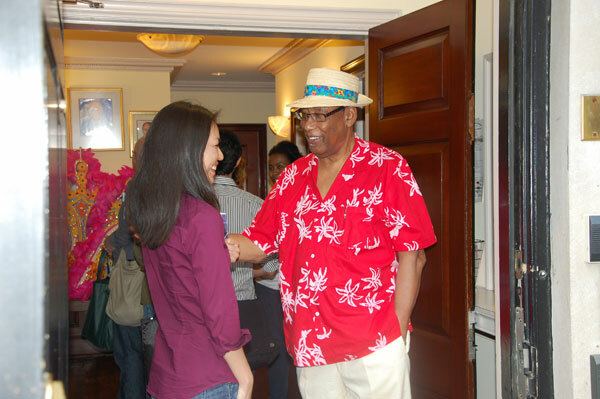 Cultural Tourism DC, a DC-based company that aims to boost tourism into the DC Metro area, held the first Embassy Open House – part of “Passport DC” – in 2008. The event was a success, and Cultural Tourism DC decided to make it an annual event. In 2009, the second year of the event’s existence, the Embassy of The Commonwealth of The Bahamas was one of about 30 embassies in Washington DC that opened their doors to the DC Metro community. This year, 35 Embassies participated in the event.